Mediterranean carries a small “m” when referring to the climate zone because the noun is massaged into an adjective to describe conditions not only in the Mediterranean basin, but also those of a handful of coastal regions around the world with largely temperate weather, long dry seasons and short, increasingly fickle winter rainy seasons. This climate of ours makes water conservation a powerful discipline. Outside of the kitchen garden, the most beautiful, appropriate and beneficial plants to use in Southern California are natives. 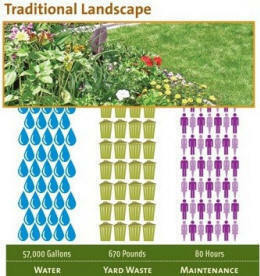 Landscaping with natives can reduce your water bill by half or more and cut costly routine maintenance by three quarters. The two graphics above, from the City of Santa Monica, reflect results of a multi-year experiment in which the inputs and outputs of side-by-side gardens, one conventional, one native, were rigorously measured. Quite apart from cost savings or the considerable smugness value of keeping a sustainable garden, nothing compares with the sheer joy of a native garden when the birds and butterflies arrive. There’s a reason that these animals flock to native gardens. They evolved on local flora, not stuff that handles shelf-life well in chain stores. To find natives that are selected, bred and kept well, you will need to go to specialist nurseries and gardens. The best ones with education programs as well as plants for sale are the Theodore Payne Foundation in the San Fernando Valley, the Rancho Santa Ana Botanic Garden in Claremont (with a nursery in Westwood) and the Tree of Life Nursery in San Juan Capistrano. Established native gardeners will know about retailers such as Matilija Nursery in Moorpark. For more listings of places offering resources for native gardeners, click here. If the seasonal plant sales are over, don’t worry. Paying less for plants bought during October Santa Ana heat waves can easily become a discount on death and failure. As hot dry systems continue to blow in from the desert intermittently until Christmas, take care when timing the shopping and planting. You may need to irrigate intermittently to compensate for those occasional desert fronts that can seem to wick the moisture out of our very souls. Ideally, however, seasonal rains moving in from the ocean should do the work for you. Ask about timing and quantity of supplemental watering at the nurseries but stifle any temptation to routinely cosset new plantings with the hose. 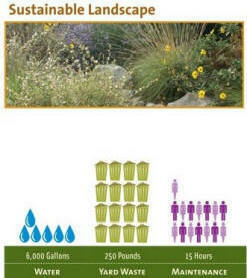 Overwatering is the leading cause of death for these plants. Above all, whether you are an experienced native gardener or newcomer, enjoy this lovely season, which is less autumnal than California’s second spring. Emily, can you tell me the source of your data for Traditional Landscape versus Sustainable Landscape? If you scroll down to the bottom of the page, you will find charts for water use, maintenance hours and solid waste production. Thanks for the mention, Emily….hope you are well. 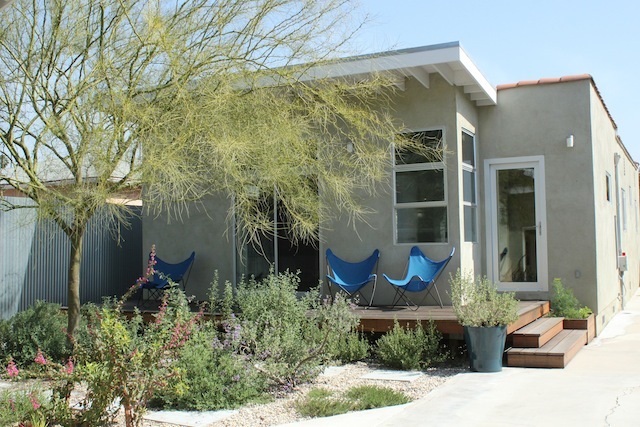 We reinvented the yard this fall; when it fills in a little please come by and check it out…. I would love to. I hope you’ll be on the TPF tour.